Lake Ontario 2017 Water Levels Only 4 centimetres Above 1973 Monthly Maximum. But well above average. Lake Deluge Exceeds Leaf Drought ! See May/June updates at end of original post. Some records are made to be broken, whether its the Leaf's Stanley Cup drought or Lake Ontario flooding. At right are the Leaf logos over the years. See the top right logo they had in 1952? And see the current bottom right logo? Old is new again with the logo, right? Same thing with maximum water levels in Lake Ontario. 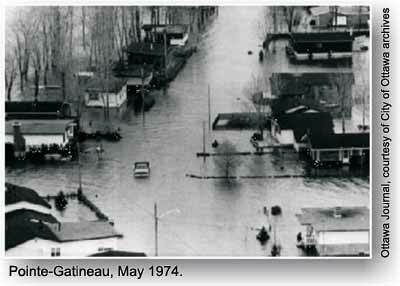 Back in 1952, from March to June monthly Lake Ontario levels hit records. In 1973 those April and May records were broken .. April 1973 was just 3 cm above May 1952 average, and May 1973 was a measley 1 cm above May 1952. It has taken 44 years to break the spring records again in 2017.
above sea level, left y-axis is depth in metres above reference datum of 74.2 metres). This is from the April 2017 bulletin available here at this link. The historical average, maximum, and minimum monthly values are shown in the table below (see full table here). 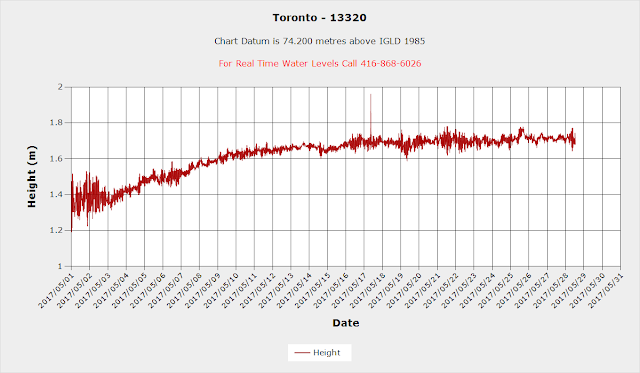 Real time Lake Ontario water depth above reference datum of 74.2 metres up to May 28, 2017. Relative to maximum historical values, the May 28, 2017 depth of 75.69 is 4 centimetres above the previous 1973 May monthly maximum of 75.65, and 4 cm below the previous June monthly maximum of 75.73 m. And 75.69 is just 7 centimetres above the 1952 May average. We visited the Outer Harbour Marina yesterday and levels have flooded the fixed perimeter dock / walkway so that temporary paths to the boat slips have been made - so yes, levels are above average and many fixed shore features have been built for the averages and not the maximum levels. 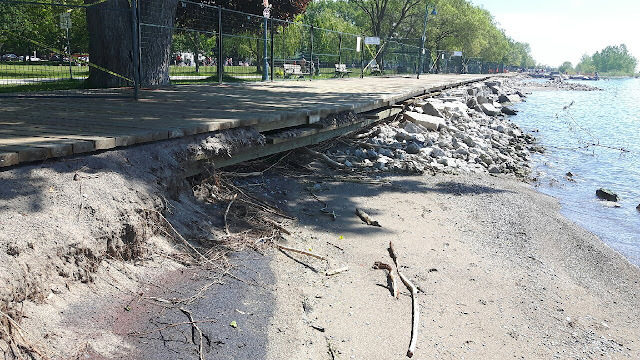 Beaches boardwalk erosion with above average Lake Ontario water levels 2017. Gabion baskets (metal wire cages filled with stone), and armour stone (large boulders), are protecting the boardwalk in the Beaches from encroaching lake levels. Further west at Woodbine Beach "Puddlegeddon" is raging on, interfering with volleyball plans although the puddles are subsiding. Lake Ontario levels are a whopping 4 centimetres higher than a previous maximum monthly value. 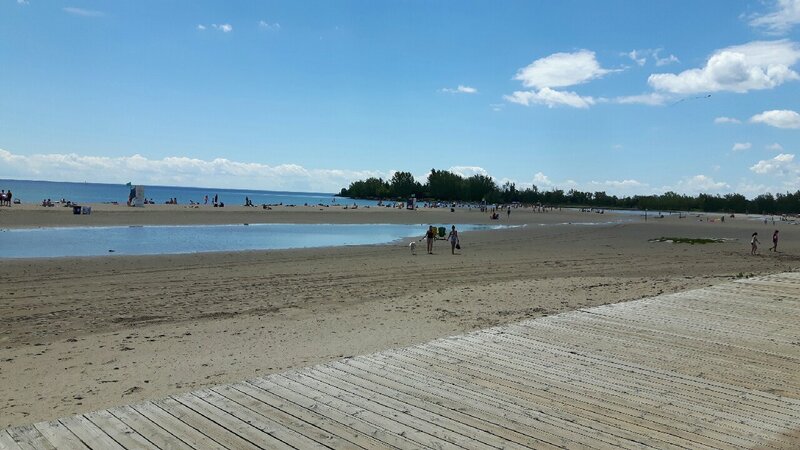 While you could say water levels are high for volley ballers who have been playing in the Woodbine Beach league for almost 20 years, the levels are only 4 centimetres above the previous May maximum. So it is not unexpected that in a 100 year monitoring record, you exceed an earlier maximum every so often. That is what statistically is supposed to happen with observations of natural systems. Today's Lake Ontario levels are not significantly above the maximum values 65 years ago in 1952 or 44 years ago in 1973. Remember to add 74.2 metres to he number Max Headroom tells you on the phone. He's no Siri or Alexa but you can get the level in English or French. 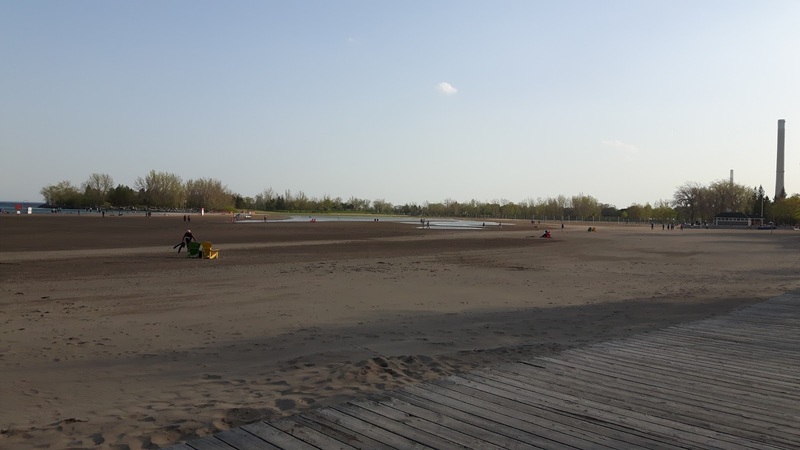 "By the end of April, Lake Ontario had risen to levels that haven’t been seen since 1993, and reached near record levels in the first week of May. By May 10 the daily average Lake Ontario water level was 75.80 m, only 2 cm below the highest level ever recorded (1918–2016) at the beginning of June 1952." It makes you wonder what is more effective and reliable, the grey infrastructure in the distance (conventional Armour Stone, gabion baskets (not visible below the surface stones), "rip rap" limestone, or the softer treatment of green infrastructure soil and roots in the foreground that has all washed away due to the force of high water and waves. Basically, the boardwalk damage happened beyond where the conventional grey infrastructure ended, where the green infrastructure failed. This experience suggests that old-fashioned grey infrastructure is more reliable and effective at erosion protection than softer revetment. Certainly the green part of the shore was robust for low lake levels and erosion forces, but not strong enough for above average conditions like we see in Spring 2017 on Lake Ontario. 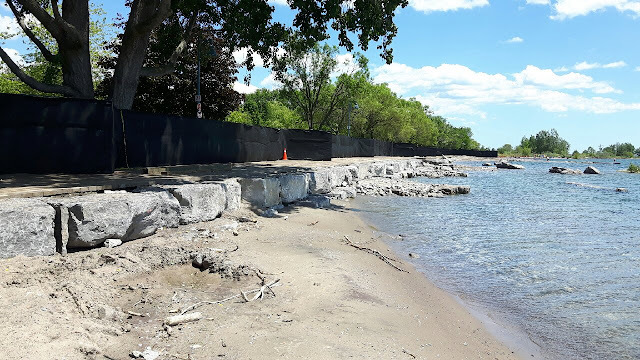 The erosion damage restoration (two layers of armour stone) has been installed along the boardwalk and will provide future erosion protection ... because water level records are made to be broken. And further west Woodbine Beach has been drying up, and volleyball has returned to larger areas (in the background) now that Lake Ontario water levels are returning to their normal lower elevations. But there is still some evidence of spring 2017 Puddlegeddon. 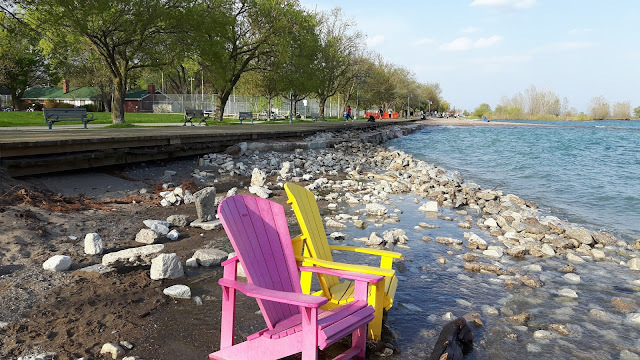 For and updated review of historical Lake Ontario water levels see this new post that explores Toronto Island storms and flooding. "The frequency of extreme weather events is increasing, and that's related to climate change," the prime minister said. "We're going to have to understand that bracing for a 100-year storm is maybe going to happen every 10 years. Or every few years." our first official "Climate Ken"? Associate Editor’s Note: In the 2012 report Telling the Weather Story, commissioned to the Institute for Catastrophic Loss Reduction by the Insurance Bureau of Canada, Professor Gordon McBean writes: “Weather events that used to happen once every 40 years are now happening once every six years in some regions in the country.” A footnote cites “Environment Canada: Intensity-Duration-Frequency Tables and Graphs.” However, a spokesperson for Environment and Climate Change Canada told Canadian Underwriter that ECCC’s studies “have not shown evidence to support” this statement. So nobel prize winning scientists have been making up a 'weather story', and the PM has been repeating it. So Prime Minister Trudeau tells us that the storms that affect less than 4% of the properties will happen more often. How about insight on why the other 96% of properties flooded? Like The Kinks I'm "Tired of Waiting" and as Mick Jagger sang "I can't get no satisfaction". "Let us first examine the contentious sentence in question. It reads: “So called ‘100 year events’ are now occurring sometimes only a few years apart.” That would be an accurate statement if the article was considering all climate-related events – including tornadoes, droughts, heat waves, and forest fires – but that is clearly not the case here. First of all, the article is about flooding, as can be seen from the many photographs illustrating it; furthermore, the sentence immediately preceding the contentious sentence reads: “In recent years, the news has been full of stories of bigger and more violent storms, and massive rainfall and flooding.” Thus, when the article goes on to mention “so-called ‘100 year events,’” it is clear that the events being referred to are episodes of extreme rainfall. One only had to examine the official Environment Canada data for Ontario as well as for the entire country to acknowledge that the claim made in the article was inaccurate. Such acknowledgement would at the same time have addressed the complainant’s criticism regarding the lack of data to corroborate Dr. Feltmate’s claim about the increased frequency of extreme rainfall events in Canada. To make that correction, and for it to be meaningful, the writer would no doubt have had to change more than just the sentence in question – which, I admit, would have contradicted, in part, the theory described in the article and the accompanying interview with Dr. Feltmate. Thus the first two sentences in the article, after being amended transparently, per best practices, would have been replaced by something along these lines: “Although in recent years the news has been full of stories of bigger and more violent storms, and massive rainfall and flooding, there is nothing to prove that this type of precipitation event has been on the rise in Canada. Data compiled by Environment Canada since the 1950s show that there has been no significant change in their frequency.” An insert should then have been added, explaining that the previous version of the article, as well as part of the interview with Dr. Feltmate, contained inaccuracies in that respect, and that this prompted RCI to publish the clarification." "He is, incidentally, one of the authors of the Environment Canada study cited above. Dr. Zhang wrote to journalist Marc Montgomery, while the latter was preparing his draft response to the complaint, that: “For Canada as a whole, observational evidence of changes in extreme precipitation is lacking.” I must take RCI to task for not having drawn the obvious conclusion regarding the truthfulness of the sentence that Mr. Muir complained about." Environment and Climate Change Canada's new report confirms "There do not appear to be detectable trends ..." - see review of more relevant risk factors besides rain trends, consistent with the ECCC report. Also, updated Engineering Climate Datasets (Version 3.0) show decreases in southern Ontario rainfall intensities based on analysis of observed rain at long term stations. GO Train flooded in 1981 too. Media misses mark suggesting new normal for extreme weather and flooding. Stranded GO Train on Richmond Hill line in 1981 in Don River flood plain. It should. The same thing happened on July 8, 2013 in the same place. 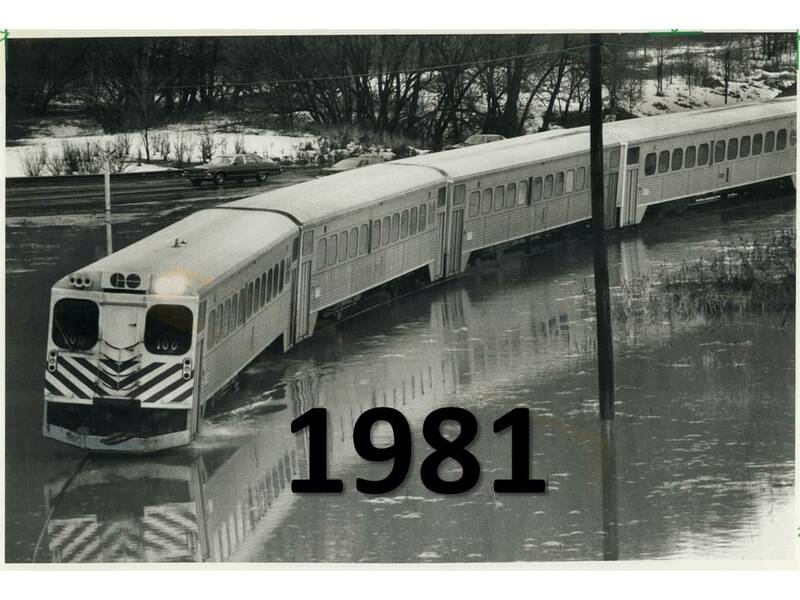 Back when you were rocking to Queen/Bowie Under Pressure for the first time, Metrolinx was getting to know the flood risks for the Richmond Hill line that started in the late 1970's. These rain line flood risks were documented in the flood inquiry report for Premier Davis. Stranded GO Train on Richmond Hill line in 2013 in Don River flood plain. 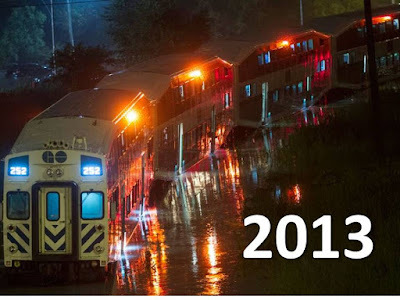 Fast forward to May 28-29, 2013 and there was a bigger flood in the same place. But it happened at night so no trains, no issue. 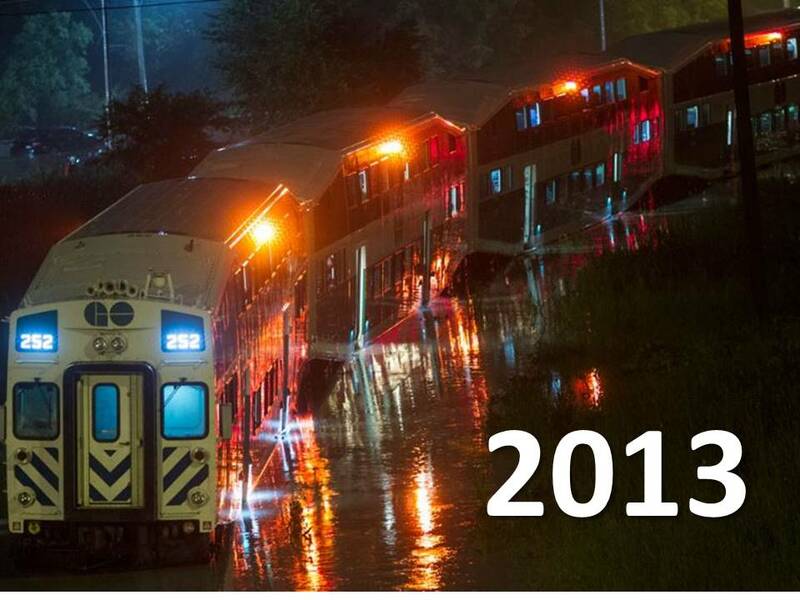 Fast forward a bit more to July 8, 2013 and we get this: another stranded GO Train in the same place. Exactly the same place? Wow! Hello McFly! It's Back to the Future. Too bad GO Trains do not fly away like modified DeLorians do. Metrolinx had to explain the 2013 incident as an unprecedented event. In fact, it was not unprecendented flooding, or rainfall, but unprecedented judgement to not monitor flood levels at the Todmonden river gauge beside the tracks. A sensor has been in place since 1962 and real time sensors were in place online for years (e.g., TRCA Todmorden gauge). Under pressure no doubt to explain how known safety risks could be ignored for its workers and passengers, Metrolinx would take a page from Milli Vanilli and 'Blame it on the Rain". Climate change, or extreme rainfall, is a quick and easy scapegoat for everything that has gone wrong in flood risk management or municipal drainage design over the past 50 to 100 years. But it does not explain incidents that should be managed as well-known operational risks. So 2013 was a big year for 'Blurred Lines", both for Robin Thicke and also for evidence-based, data-driven reporting on flood risk factors. Today there is widespread misreporting that water level sensors were installed on the Don River after the flash flood of 2013. Perhaps extra sensors have been installed? The truth is that they have been in place for a long time. If we are going to have effective solutions to flood risk mitigation, we have to accurate in characterization of flood causes, whether it was deficient Keating Channel dredging in the early 1980's or operational decisions in 2013. Otherwise we will "Blame it on the Rain" like Milli Vanilli and concoct misguided solutions to problems that do not exist. Solutions that could be worse than useless and miss real effective opportunities for risk mitigation. So there is not really a new normal for rainfall and flooding, just more of yesterday's extremes, accentuated with 24-hour cable news, 24-7 weather reporting, and cell phone videos to capture every popped manhole, soggy underpass, or puddle that occurs in a big storm.